With no background in interior decorating, it can be hard to tell the difference sometimes between pelmets and cornices. They have routinely, but somewhat incorrectly, been referred to as valances. 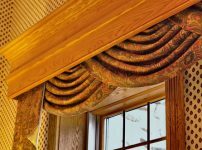 But valances are made of a soft, hanging material/fabric and are softer looking, more casual, and tend to be gathered at the top. 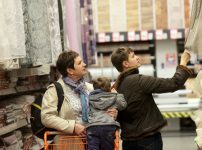 Both pelmets and cornices are technically referred to as ‘hard’ window treatments and can also be used interchangeably to decorate the upper edge of a window. Truth be told, however, there are slight differences between these two top window treatments. A pelmet is commonly used in the concealment of curtain fixtures. It differs from a cornice in that the layers of decorative molding and crown usually found in cornices are both missing in the pelmet. A pelmet can be made up of a flat layer of fabric over a wood frame (which can contain a foam padding). This sits at the upper edge of the blind, shade, drape, or other window treatment and covers it. Faux wood, plaster, or wood usually make cornices and this is another area where pelmets differ in that they are cloth covered. Additionally, pelmets do not form any part of the room’s molding – it simply covers the window top or other structure. Cornices differ in that they relate directly to the crown molding as it interacts with the room’s window. The word cornice (or ledge) can be used in the description of furniture, a building, or a window and refers to a decorative, horizontal molding. This particular application refers, of course, to a piece that runs along the top of a window from one side to the other and can be used to hide curtain hardware or the tops of window blinds. It can also add a softer touch to window treatments making them less stark and bare. A multitude of decorations can be added to the cornice. Actual cornices have a top, projecting crown and may have sub-layers of decoration. For example, carved wood could be used as a middle layer situated between smaller crown-like projections. As the projections progress downward, each becomes smaller than the one above it. Endless possibilities exist by varying the curvature, height, size, shape, and number of projections. According to one interior decorator, a pelmet can actually be considered a type of cornice. Earlier, a valance was mentioned. A pelmet can be defined as “a short cornice or valance used to conceal curtain hardware”. It all sounds confusing, but a professional can expertly assist with all of the terms and choices you may run across in your search for the ideal window treatment. Ready to Order Pelmets and Cornices Today? Pelmets and cornices can hide a multitude of design sins, add a decorative flair to a room, or both. They can accentuate a particular aspect of your decor or color choice and soften routinely simple or ‘cold’ window treatments. If you are interested in using them for a new home construction, or you simply want to update your current window treatments, talk to us at Vogue Window Fashion today to learn more.